russell westbrook - Phillips Murrah P.C. Click the photo to see Jenni Carlson’s story about Brenda Hawkins. Russel Westbrook has his own room at the home of Phillips Murrah Director Terry Hawkins, who leads the Firm’s Public Finance Practice. There’s no bigger Russ fanatic. (Brenda Hawkins) has replicas of every jersey the Thunder superstar has worn. She has copies of dozens of magazine covers he’s graced, including one from, of all things, a rural electric cooperative. She has bobbleheads and fatheads, paintings and posters. Standing in “The Russell Room” in her Mesta Park home, she admits her love is extreme. This past Sunday (2/19/17), The Oklahoman ran an excellent story about Terry’s wife, Brenda, who is a avid admirer of Westbrook and collector of all kinds of Westbrook-related memorabilia. The touching account, written by sports columnist Jenni Carlson, explains the context of Brenda’s collection and admiration of the Oklahoma City Thunder’s star player. It is a story of strength and overcoming. Rather than stepping on the fine prose of Ms. Carlson, HERE is a link to the story. It is worth the read! Rae White, Lisa McAlister, and Michelle Munda get a good spot to better see Russell Westbrook as he arrives. 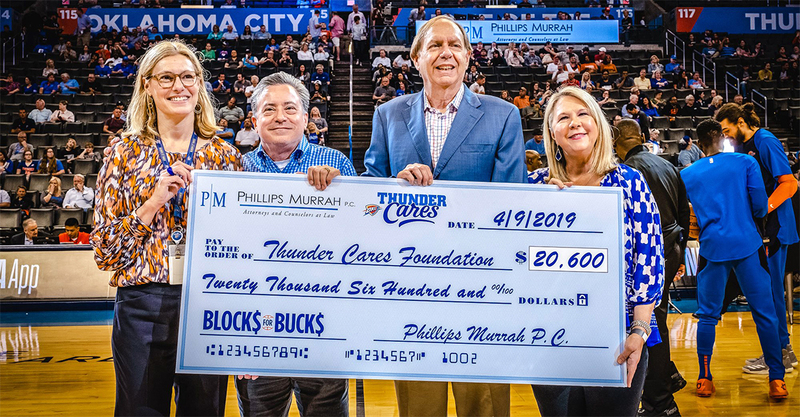 Russell Westbrook made an appearance at the Chesapeake Energy Arena on Aug. 4 to celebrate the extension of his contract with the Oklahoma City Thunder and to celebrate what Mayor Mick Cornett proclaimed Russell Westbrook Day. Representatives from the Thunder put out a call to the public letting them know he would be at the arena to greet fans. Although hot out, a group of Phillips Murrah employees made their way to join the crowd outside of the arena and waited to welcome him before he participated in a press conference. Upon arriving, Westbrook took a moment to thank everyone who showed up for showing their support.